Hope everyone (at least in the US) enjoyed their long weekend! I used the time to finish up some lingering sewing projects and get caught up on homework. Speaking of lingering sewing projects, not only did I finally make a new pillowcase for the pillow on my couch, I also finished Simplicity 2512! The pattern was designed by Cynthia Rowley (who’s guest judging on Project Runway All-Stars this season) and while it was pretty straight-forward, for some reason I just had so many issues finishing it. First, I bought the wrong color zipper (should have gone with black since the fabric is such a dark grey, but I digress), then I had to wait to go back to my parents’ house to pick up the hem tape for the hem since I ran out of fabric (the skirt is made out of Pendleton wool remnants) to make more bias binding, then I had issues sewing in the invisible zipper, because for some reason I kept sewing on the teeth and then had to rip those stitches out. But, it’s finally done! 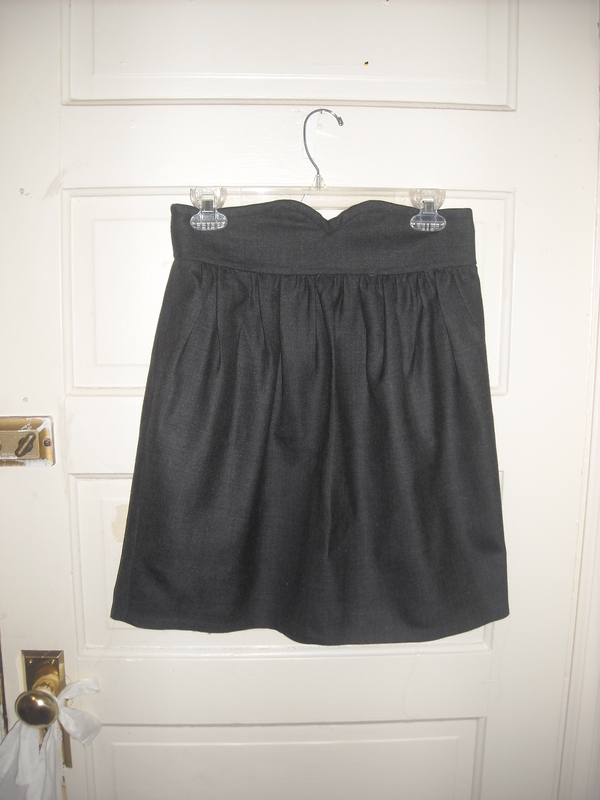 You can’t tell from the photos, but the waistband is a bit too loose (although it keeps the skirt up just fine). And I don’t know if I entirely like the shape. it’s not quite a full-gathered skirt, but not quite a pencil skirt (even though it does have the vent in the back), so it makes my hips look a bit bigger than they really are (which is why I omitted sewing in the pockets – self sewn-in pockets on my skirts always have a tendency to make my hips appear wider than they are). Anyways, despite the challenges posed and uncertainty about the shape, I’m glad to have this project done and a new modern skirt in my closet. It’s been so rainy here lately, so I haven’t had a chance to wear it outside just yet, but I’m hoping to soon. Previous Post Introducing the Puget Sound Ladies Costume Society! Oh, so cute! I love the kick-pleat in the back–what a nice touch! Perhaps next time you could just do a regular ol’ waistband it’s not so loose? Love it – Looks fab! And what are you talking about, girl? It doesn’t make your hips look big! I love the top line on the waist-band, it’s a nice touch! a-DOR-able. Love the waistband. How about a lighter colored top to show it off? You have such cute clothes. Love to see them! This looks so cute on you! I love that curved waistband! It’s a nice length, too. I made this skirt, too, but the fabric I used started to come apart after only 2 hours of wearing it! The waistband on mine is too large even though I rounded down my waist measurement. Oh well, lessons learned! Exactly! Every mistake is a learning experience.